Alvarez & Marsal (A&M) provides world-class performance improvement, turnaround management and corporate restructuring services, as well as multi-disciplinary industry expertise, to clients in both the public and private sectors. Founded in 1983, A&M is a global professional services firm whose corporate experience with turnaround situations includes companies ranging from Lehman Brothers to HealthSouth. Our delivery approach often includes professionals who have held senior positions in government, education and the private sector, to provide insights on best practices and develop plans that are actionable over the short-term and transformative over the long-term. A&M’s Public Sector Services consulting group was launched in 2003 to serve the unique needs of government, focusing on government-wide turnaround strategies, health and human services solutions, and K-12 turnaround initiatives. As a leading public sector consulting firm, A&M goes beyond providing recommendations. Whether the mission involves creating a government efficiency initiative, redesigning an ineffective Medicaid system, or reevaluating a school’s budget to fully leverage its resources, A&M brings a sense of urgency to every situation, a pragmatic, hands-on approach and a relentless focus on execution, accountability and results. Our services enable government entities, organizations and leaders to solve complex problems, to improve performance, to maximize value for citizens and to produce a social impact. A&M’s experience, as a leading public sector consulting group working to improve the operations of numerous governmental and corporate entities, provides a unique perspective and enables us to identify opportunities that might be overlooked by others. We go beyond developing recommendations and reports—we design reforms and work side by side with our clients to implement them. We create a roadmap forward for the agencies we work with, enabling them to continue serving their stakeholders effectively and efficiently into the future. A&M’s work as a public sector consultant includes 13 states, multiple cities, school districts and universities. We have helped government officials better serve their constituents by streamlining operations, managing their budgets effectively and improving performance – finding ways to accomplish their mission while being prudent stewards of taxpayers’ money. Performing budgetary and operational reviews, designed to help government agencies function more effectively and efficiently. Serving in interim management or crisis management roles providing short-term leadership. Providing actionable recommendations, designing detailed implementation plans and working side-by-side with client personnel to put those plans into effect. Identifying and implementing significant and immediate cost savings for entities which are facing fiscal crises, while building consensus and support among stakeholders. Assessing operations to find cross-agency efficiencies and economies of scale. Maximizing federal funding, enhancing compliance, and identifying opportunities for improving non-tax revenues. Providing expertise across diverse governmental functions, ranging from benefits to transportation to healthcare to public safety. Driving awareness of the voice of student to realign university investments. Standing behind our recommendations in public when the situation calls for it, before legislative bodies or in the media. Our culture is based on an unwavering set of core values: “Never let financial gain compromise integrity and demand integrity of ourselves above all.” We embody this value in every action the firm takes. 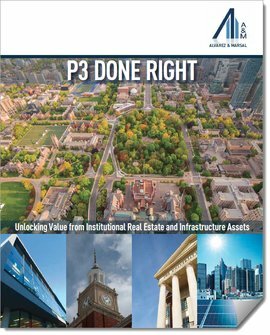 Alvarez & Marsal partners with public and institutional leaders to leverage value from and increase the useful life of real estate assets. A&M offers a full range of real estate services, providing customized solutions that address your unique fiscal and operational needs. Public entities and institutions face a unique set of real estate challenges. Capital and operating budget limitations often inhibit adequate maintenance, renovation and expansion of needed facilities, eventually hindering core business operations. However, many of these underutilized assets have significant market value, which can be leveraged to fund facility improvements and expansions, promote economic development and job creation, and generate revenue. A&M provides independent advisory services from strategy and analysis through transaction support, not tied to the value or execution of a transaction, enabling us to provide impartial recommendations that benefit our public sector clients. Our interests are always aligned with the economic and policy objectives of our clients. In its seventh year in office and already having undertaken multiple cost-savings initiatives, Governor Jindal’s administration retained A&M for a government efficiency initiative covering multiple state agencies. Over a four month period, A&M worked with each of those agencies and built consensus around dozens of recommendations, implementation of which could begin immediately, and which will realize more than $500 million a year in cost savings and non-tax revenue enhancements. Agencies included in this project included Revenue, Economic Development, Risk Management, Transportation, Public Safety & Corrections, Health & Hospitals, Children and Family Services, Facilities, Group Benefits and Procurement. Facing budget pressure, a City was looking for ways to meet citizens’ service needs and support operations, all while balancing the budget. Analysis by the City’s Finance department discovered that a significant source of unrealized revenue was being lost to business permit non-compliance. A&M was engaged to help address the revenue leakage through improved permit compliance identification techniques, coupled with application of lean initiatives to increase the permitting capacity within the current cost structure. By applying lean techniques across multiple departments and developing Supplier Relationship Management (SRM) with third-party collection agencies, the City’s collections/revenue has increased by over $20MM annually. A&M was instrumental in the recovery of the New Orleans public school system in the wake of Hurricane Katrina, served as interim management for the St. Louis Public Schools, formed a restructuring team for the New York City schools that reallocated $200 million a year from central administration into classrooms, and held significant advisory positions with school systems in Washington, DC and Detroit. A&M executed a broad scale effort to shore up the Commonwealth’s finances, identifying $1.7 billion a year in recurring savings and non-tax revenue enhancements. A&M was appointed by a U.S. territorial government in the midst of a series of downgrades by major bond rating agencies and a highly-charged political environment. After taking on interim management roles, we realized the budget deficit was actually five times larger than previously thought. Our team included professionals with experience in healthcare, tax, education and public safety who were able to set the government on a course to close a $1 billion gap over two to three years. Facing cost overruns in its Medicaid system of nearly $1.8 billion over a five year period, a State Department of Health & Human Services retained A&M and asked us to serve in Interim CFO, Budget Director, and Program Integrity Director positions. We redesigned an outdated organizational structure, gained transparency into key expenditure drivers and built a forecasting model that would allow for accurate budgeting and restore the agency’s credibility. The last year-end close showed a $63 million surplus for the agency. A&M identified how a state Office of Risk Management could save $21 million a year by changing its process for procuring insurance on state-owned properties by attracting more bidders and increasing competition. By implementing a strategic sourcing initiative for all procurement across various agencies, A&M estimated cost savings for its client would be in excess of $60 million a year. To utilize the Fairfax County contract with A&M, you must be registered as a participating agency. To get started, call 844-768-8244 or REQUEST CONTACT. A&M has committed to providing participating agencies with our lowest public sector pricing for our consulting services. A&M’s Public Sector Services consulting group was launched in 2003 to serve the unique needs of government, focusing on government-wide turnaround strategies, health and human services solutions, and K-12 turnaround initiatives. As a leading public sector consultant for entities at the municipal, state and federal levels, A&M goes beyond providing recommendations. We work with a range of state and city offices and agencies, municipalities, health and human services departments, and state and local education authorities to design and implement reforms. Whether the mission involves creating a government efficiency initiative, redesigning an ineffective Medicaid system, or reevaluating a school’s budget to fully leverage its resources, A&M brings a sense of urgency to every situation, a pragmatic, hands-on approach and a relentless focus on execution, accountability and results. Our services enable government entities, organizations and leaders to solve complex problems, to improve performance, to maximize value for citizens and to produce a social impact. What kinds of solutions does A&M offer? Serving in interim management or crisis management roles to provide short-term leadership. Providing recommendations for action, designing detailed implementation plans and working side-by-side with government officials to put those plans into effect. Maximizing federal funding and identifying opportunities for improving non-tax revenues. Providing expertise in virtually every governmental function, ranging from benefits to transportation to healthcare to public safety. What do A&M’s fiscal and operational solutions entail? A&M’s solutions drive financial, budget and process improvements, supporting efficient and effective management of government, not for profit and education organizations and programs. Our projects maximize financial, human capital and other resources to transform programs and institute fiscal control. Our experienced leaders serve in critical management roles on an as-needed basis and testify on behalf of clients to legislatures, boards and executives. What makes A&M different and better? A&M’s experience, as a leading public sector consulting group working to improve the operations of numerous governmental and corporate entities, provides a unique perspective and enables us to identify opportunities that might be overlooked by others. We go beyond developing recommendations and reports – we design reforms and work side by side with our clients to implement them. And we create a roadmap forward for the agencies we work with, enabling them to continue serving their stakeholders effectively and efficiently into the future.